Writing a review requires an account. You may already have an account with one of the choices below. If not, it is very easy to setup an account following the sign up instructions on the page you visit. Write a review with a Yelp account. Write a review with a Google/Gmail account. Write a review with a Facebook or Yellowpages account. Write a review with a Angie’s List account. If you would rather not use one of the above options to write your review, please feel free to email us your feedback and we will be happy to add it to the list of testimonials below. I recently had the daunting task of having to deal with our 15 year old a/c unit. I contacted our trusted local plumbing co. For a reputable and ethical a/c co and they immediately referred me to Conejo Valley heat and air. I called for a “tune up” and Ralph was the technician sent out. He did a thorough job inspecting as well as explaining all that he found with options and estimates. He was professional and never made me feel pressure to make a decision on the spot. We decided to go with the good news that it was not our unit, which would have cost us twice as much, and resolve our inadequate and inefficient ducting. Greg was sent out and went over all the choices thoroughly and we decided to schedule the work. Their company made ALL the arrangements for us ( abatement , permits etc) and completed the job as quickly and for the exact cost they quoted. Their crew was professional and friendly and thoughtful of our home. I would highly recommend this co to anyone taking the time to look for a reliable a/c business. I initially contacted Conejo Valley Heating & Air for a service on my 30 year old HVAC system. The tech, Bret, was on time, friendly & knowledgeable. He performed the maintenance, but show ed me several places where my system was failing and lacking safety upgrades. After reading the company’s excellent online reviews, I scheduled an appointment with Greg to discuss the purchase of a new system Greg explained my options in detail and spent time answering all my questions. I was told that the installation of a new heater, A/C unit, and ducting would take about a day. The installation crew arrived on time and took every precaution to protect my home and cause as little disruption as possible. They removed the old system and it was hauled away before they left the site. The foreman took care to walk me around and show me the new system and how it operated. The installation was quick, clean and professional, and finished in less than a day. After the installation Branden came out to meet me in person and ensure that the project was completer to his standards. Without exception, each person I dealt with from Conejo Valley Heating & Air was polite, informative and treated me and my home with respect. All appointments were made with ease and consideration for my schedule, with most scheduled after work house. All work was professionally and efficiently completer. I would definitely recommend this company! CVHAC replaced our 36 year old heater and installed a new air-conditioner. We had some unique requirements which CVHAC gladly and effectively accommodated. We are very pleased with our installation. The heater is much quieter and more effective than the old unit. The air conditioner is extremely quite – much more quiet than the other A/Cs in the neighborhood. I can hear their units from inside my house, yet I cannot hear my own unit when it’s on. We are very pleased with our new installation and even though it is new, we are confident that it will serve us well for years to come and that CVHAC will be there if post-installation support should become necessary. I requested one of your service technicians, Ralph to look at our failing furnace last week. Since I don’t want to setup a Yelp account to post my review, I would like you to post my feedback to your website. Ralph impressed me greatly with his knowledge, timeliness, communication, professionalism, and helpfuless on making our decision to purchase a new furnace versus trying to repair our antique one (It did well for 38 years). He is truly a great guy to deal with. He is a great asset to your company. I wish him extremely well on his career with your fine outfit. If I had to rate him on a scale of 1 to 10 I would give him all 10’s. The same goes for Greg Jamroz, who helped secure our decision to purchase a new furnace yesterday. In summary, folks like Ralph and Greg help to make Thousand Oaks a great place to live, as we have for the past 35 and a half years. Your service has been excellent. even better than what we expected. On time; on budget; no surprises; very professional. Recommend you every time. I am always pleased with the service I receive from Conejo heating and air. We have been using their services for over 15 years. They are competent in all their work and have a very friendly staff. At the end of the job, they clean up and leave no mess. They have expertise whether u need air or heating repairs. I never have to worry when the job is complete. A definite recommendation. A big thank you to all their employees. Conejo Valley Heating and Air was recommended to us by several people and boy, did they live up to their kudus. We had the misfortune of having our water heater go out leaving us with a mold issue. In addition we had to replace on old heater and air conditioner. Conejo Valley Heating and Air sent a representative to look over the scope of the entire task. He recommended several vendors to do the clean-up work and perform the necessary post-treatment inspection. They took care of obtaining the required permits and coordinating the work between these vendors and their own installation work convenient to our schedule. All of the companies were on time, professional, did great work and cleaned up each day. The entire effort was completed without a hitch and we passed all of the inspections as well. Their representative came to the home prior to the work and after the final State inspection to ensure our satisfaction. The Conejo Valley Heating and Air install team was courteous, neat and professional. The lead installer answered the questions that we had and instructed us on the use of the system after installation was finished. They cleared away all of the old equipment. I, too, will recommend Conejo Valley Heating and Air to anyone requiring an HVAC unit or a water heater. Their work is superb. I recently had service done on my mobile home and I wanted you to know how pleased I was with your service. I had to have an adjustment made on the duct work and was extremely pleased with Bobby. He was so polite, and professional. I will recommend your company highly. It was such a pleasant experience doing the job of replacing the heating & air conditioner. The crew was very clean no mess left they worked very hard to get it done in one day which they did. The new duct work seems to be working very well. I have air coming through where I had none before. There was one minor thing that they needed to come back for & came in a very timely manner. I have told several people to call you if they have any issues. Thanks again! Wally – I told you some of this in person but want to also share it with others. Your team did an incredible job of replacing my rooftop HVAC unit. From Bobbie’s initial visit and proposal to the completed installation today, the team’s performance was nothing short of impressive. Everything was well coordinated — the delivery of the new unit, the arrival of the crane, the pickup of the old unit. The crew went to work right away in a very professional, courteous and efficient manner. Everything seemed to work like a well-oiled machine in the tight confines of a condo environment. No damage, no mess. Your instructions to me on what will follow were clear and precise. And last but not least, everyone showed up on time — not often the case in my experience with contractors! Thank you for a job well done. I will not hesitate to recommend your company to anyone whenever I have an opportunity. I just wanted to say thank you again for a great job on the new heating and a/c you installed a few months ago. With the recent heat wave I was able to see the true results of the new system and the a/c is fantastic!!!! Wally….the duct booster you put in for to fix my upstairs airflow problem is working unbelievably well. It’s awesome!!!! I just had Craig McConnell service my furnace and cooling system. He is a quality individual and very efficient. Please convey my sincerest thanks to Craig for the manner in the way you conduct business. We so appreciated your timely advice and expertise to help our son out with a complicated water heater problem last week. Jeff Crane was right, you were the go-to guy. Your company will always have our business and I intend to spread the good word! I just wanted to take a minute to personally thank you for the service call Craig McConnell made to our home on December 3, 2013 and for not charging us not only for the service call but to replace the wireless thermostat that we broke. In the last three weeks all three of our cars were in for some form of repair work (two broke down and the third was hit at 2 am by a drunk hit and run driver while parked in front of our house). I was figuring to have to write another repair check to you for the service call and replacement of the wireless thermostat and was stunned when Craig told Ilene that there was no charge. I know the charge wasn’t going to be a lot but your gesture was the first good thing to happen to us in a bit! Ilene and I are greatly appreciative of your help over the past few months. Happy holidays to you, your family and wonderful staff. Branden Dickey and his expert team installed a new Trane HVAC system in my condo within 4 hours time frame and were very diligent and clean through the entire installation process. Branden’s team worked very efficiently together and also very professional to deal with. Very honest company who truly cares about meeting and exceeding customer expectations. 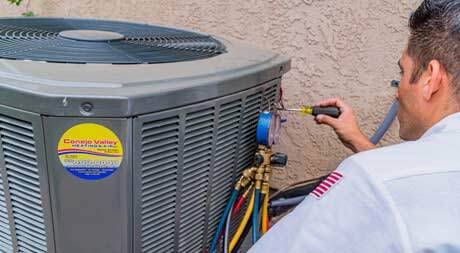 They will work within your budget to provide you the best recommendation on which brand of HVAC system will suit your specific needs and not oversell you on an inferior system or products. We did our research on which HVAC brands were ratest highest, but if you don’t hire the right contractor to install your new HVAC right the first time, you’ll pay for it in the long run with unwanted mainentance repairs. 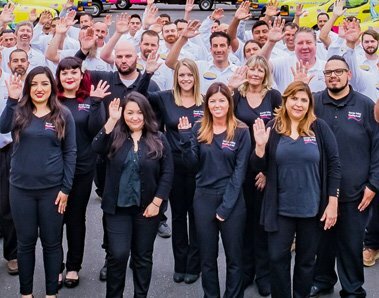 Conejo Valley Heating and Air Conditioning is a contractor you can certainly trust to do the best job and do it right the first time! I would recommend this company to friends and coworkers. Branden, office crew, and field crew Thank you! Thank you! Thank you! I so greatly appreciate how you all went above and beyond to install the air conditioning system for us at the park Serrento address. You even put in sunday time when it was hot. You heaped coals of kindness in a difficult situation. You finished the job even though you had nature against you (the wasps), but god was with you and yours devoir effect. We just wanted to thank you and your company for assisting us with our home inspection. It looks like we are going to close escrow tomorrow, and we will be calling you shortly to have the repairs done on the house. We posted a review on yelp today, and hope that this will assist you in gaining new customers that you so deserve. As our heater cranks on in this “cold spell” I’m reminded that we never sent a letter of thanks for your incredible service last summer. After years of sweating out those hot Newbury Park summers (lol), installing the central cooling unit was overdue. As it turned out it really was a hot summer so we needed the air more than we knew at the time. As I mentioned, now that it’s cold the unit heats our house so much better than before. All of this with little change to our utility bills since the systems are so much more efficiant. You instilation team was the best team of anybody we’ve ever had at our house to do anything, and we’ve had quite a few. Home repair can rarely be called a delightful experience but Conejo Valley Heating and Air Conditioning is probably as good as it gets. Our 35 year old air conditioner evaporator began to leak during the worst heat wave of the summer, a time when air conditioner repairs are at their peak. Conejo Valley was efficient in answering our calls and did their best to fit us into their busy schedule. I appreciated their explicit instructions regarding the permits and HERS rater as well as their communication as to exactly when the workmen would arrive to complete the job. The owner Wally came to our house for a few hours on a Saturday to inspect the work and adjust the vents for maximum air flow. I give Conejo Valley Heating and Air Conditioning FIVE STARS! “Very Satisfied” best describes my experience with repairman Bobby Montiel. Bobby is a true professional. It is always a pleasure to see him. I have total confidence that any and all work that Bobby does will meet the highest standard. I commend Conejo Valley Heating and Air Conditioning for hiring such a fine repairman. It is a pleasure to do business with your company. I scheduled a service call for my air conditioning unit after the fan stopped working and was extremely pleased with the response and the excellent service that was provided by the man himself, Wally Dickey. 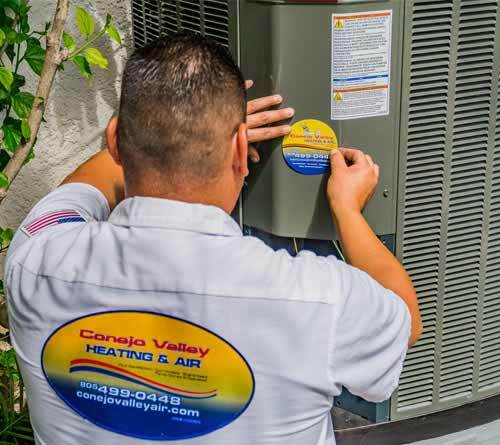 I was impressed by his knowledge, honesty and efficiency and will recommend Conejo Valley Heating and Air in a heartbeat to anyone that is looking for the kind of reliable and reputable service that you provide. Message: We have been customers of Conejo Valley Heating and AC for almost twenty years. Last week our AC wouldn’t turn on. Brandon came out, diagnosed the problem and fixed it by tightening a couple screws. No charge. It’s such a pleasure to deal with an honest reliable company. When I called Conejo Valley Heating & Air around 9:15 AM, I was told someone would arrive between 10 AM – 12 PM. Branden was at my door at 10:05AM. My heater had been cycling on and off before it ever reached the temperature the thermostat had been set for. Branden quickly identified the problem as simply being a very dirty filter and an obstruction to the intake vent to the furnace… things I should have been able to discover myself. After hosing off the dirty filter and moving the obstruction, Branden wouldn’t take any payment at all! Whereas other, unscrupulous servicemen could have trumped up some story about having to replace expensive parts and overcharged for them, this man was HONEST! What a wonderful trait to find in the service industries these days! I tried to pay him for gas money for his trip and trouble but he wouldn’t take it. What a WOW in service! In the future, Conejo Valley will be the first I call whenever I have a heating/A.C. problem. The heater works just fine now. I am pleased to recommend your service to all who need it. YOU ARE THE BEST. I have been a customer of Conejo Appliances for almost 25 years and they have never let me down. They have installed my new furnace, air conditioner, and water heater as well as repaired the old ones, including my stove and clothes dryer. I have recommended them to my family and friends, all of whom feel that they are the best. From the ladies who answer your calls to the technicians who come to your home – every one of them are friendly, helpful and trustworthy. The installers are efficient and knowledgeable and on time. They will go the extra mile for you and in this day and age not too many will make the effort. I just want to thank you for the wonderful service that you provided to us recently. Your professionalism and willingness to go the extra mile to keep our older unit working is commendable. You were honest about the condition of our air conditioner and still did not try to immediately sell us a new one, even though I realize that it would have been much more profitable for you to do so. You have earned my trust and respect. In closing, you secured me as a future customer and I am going to recommend you to everybody I know. Many thanks for a well-done job installing our new HVAC system. Everything was great from beginning to end. We contracted you based on the recommendation of a friend and neighbor who was pleased by your services. You can add us to that list of satisfied customers. You came to our home, listened, observed, and made recommendations that were in our best interest. Then, upon our request, you provieded a detailed proposal for providing services which we accepted. Your prompt installation was provided by a very courteous staff and we are very pleased with the results. Your hands-on supervision of the entire process was appreciated. I just wanted to thank you so very much for the recent ducting job you and Conejo Valley Heating and A/C, Inc. did at my home. Your crews were beyond professional, courteous and efficient. Everyone involved in the job made me feel like they really cared about the work they did, and were quick to reassure me of the safety of my house and system. I cannot thank you enough for your service. Recently I replaced my entire heating and air-conditioning system. After getting estimates from five companies, I chose Conejo Valley Heating and Air and I’m happy that I did. He and his crew did a great job. Wally was the epitome of patience in explaining the nuances of such systems and was very helpful in guiding my choices. So if you want a contractor who is honest, knowledgeable, reliable, and who goes the extra mile – Wally is your guy. A belated note of thanks for a clean and thorough job of installing a new furnace in my condo unit. The work was done in a timely and courteous manner. I do not hesitate to recommend your service to others. You came highly recommended by friends, and they were correct. The heating and air conditioning system was installed and has run for about six months without any problems. The TO inspector checked everything without any concerns, and signed the permit. I will definitely recommend you to our family and friends. I can’t tell how happy I am you were referred to me. You saved the day, after a very bad experience with another company. I appreciate you coming to my home right away and assessing the problem in such an honest and professional manner. The air conditioning system you installed works great! It’s so nice not to have to worry about it breaking down again. I would highly recommend your services!! Thank you again for all your help and professionalism. We are very happy with our new heating and air conditioning system. Kyle and the crew were very professional and polite. They replaced our old equipment and installed the new system in about six hours. They did a good job on cleanup. The Agoura Hills inspector checked everything and signed the permit. He did not have any questions or concerns. We will defnitely recommend Conejo Valley Heating and Air Conditioning to our family and friends. Just wanted to say Thank You for extraordinary service performed on our A/C on August 15th/16th. Both Branden and Kyle gave exceptional service & are great at what they do. It’s nice to see someone actually go the extra mile & have pride in their job these days. All the workers who came wer courteous & fun to talk to for a brief momemt, while on their way in or out. We chose to call on you guys for our A/C needs because of your longevity in the community. We love to support local businesses as our family, too, has been in N.P. for years (1963). Two generations of our family have gone to NPHS just like you guys…and our 3rd will go there in just over a decade. We’ve got 4 generations still living here in N.P. & have known your company & it’s great reputation for years! Your exceptional service is truly appreciated & should not go without recognition. We will recommend you to everyone we know. What a great job and what a great organization. It is refresing to deal with an organization that delivers what they promise. Conejo Air installed new ducting and replaced 3 aging A/C units and 3 heating units with all new Trane equipment. The project could not have gone more smoothly. Branden sized up the project and determined the work that needed to be done and the equipment to be installed. Wally and crew moved in and did a grand job. The work was completed in 1 day and our home was left spotless. Everyone who came into our home was courteous and considerate. Not to mention the AC works great. Without hesitation we recommend Conejo Air for all AC heating and appliance needs. I was very pleased to find Walt after searching for, and interviewing, A/C contrctors. I liked the technical depth of Walt’s information and the breadth of his experience. It was clear we were dealing with a real expert and seasoned professional. It also helped that our neighbors used Conejo Valley Heating & Air and were very pleased with the results. Kyle brought an army with him and got the old system removed and the new system installed in record time. It works beautifully. These are good, competent people. They do good work. We’re very pleased to have found them. Wally and crew from Conejo Valley Heating & Air Conditioning installed a new “dual system” heating and air conditioning system in our home in February 2008. Wally came highly recommended by friends and after Wally presented his proposal we discovered that several other acquaintances had also had his company install the same system in their home. Every person was highly complimentary of the system and Wally & his crew. Now that our job is complete, we can also say that Wally is one of the most competent, fair, honest, and thorough contractors we have ever dealt with. When he says he is going to arrive at your house, he is there. When he tells you what is going to happen during the job, that is exactly what occurs. His pride in his workmanship carriers over to his crew. All were courteous, friendly, hard workers who truly seem to enjoy what they do and do it well. We have had several questions since the install and Wally is always immediately available to answer our questions or come over asap to correct any adjustments needed. I would highly recommend Conejo Valley Heating & Air Conditioning to anyone who needs this type of work done in their home. After 3 months, 4 plumbers and 2 heating companies, Wally was the ONLY one who could figure out what the problem was with our complicated water heater/heating system. We are grateful to Wally for his prompt service, his reasonable prices, his expertise and his honesty. Dear Wally & Staff,Thank you so very much for making the time & effort to come and fix our A/C last Sunday! With a house full of company, you truly were my hero (and theirs too!) We can only imagine how stressful the last couple of weeks have been and we truly appreciate the excellent service. Have a great weekend! 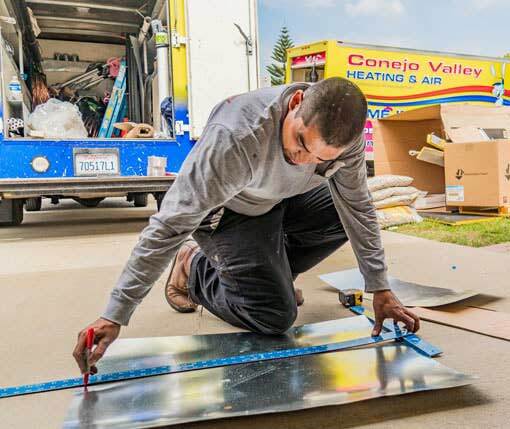 Dear Conejo Valley Heating & Air Conditioning,When you walked onto our job, we had already replaced our HVAC units and ducting twice in four years. We were frustrated and disappointed that each costly new system installed still did not cool our upstairs. Each company told us it was the best we could expect for our house design. Then we called your company. Your company listened to our wishes and complaints, thought through the problems and solutions before tearing into our walls, and delivered a system that works perfectly. (Yes, you proved the others wrong!) You gave a lot of your time and concern to solve our difficult problem — and it was all done in a professional and courteous manner. As you know, we also voiced concerns that damage could occur to some our unique home features. Wally, you added protective padding, told your crew to go slow, and to be extra careful in our house. We appreciate that your crew showed such genuine concern for our home and belongings. We will whole heartedly recommend your company’s services to all. After experiencing your outstanding performance on our complex job, we’re sure you can handle any job that comes your way. Dear Wally:You came highly recommended to me by a mutual associate. I interviewed two or three companies and determined that you were the most knowledgeable, most concerned and most interested in making sure that the job was done properly. I made an appointment, and yourself and your crew came out and installed my air conditioning and heating. I must say it was a lot more involved than I had anticipated. But as you were saying during the install “it will be well worth it”. I am very happy with the install. I did have some minor issues after you and your crew finished. However, I was so impressed by your immediate response to my phone call. You immediately called me and handled each item of concern. I would highly recommend you to my friends and neighbors for their heating and air condition needs. You handle yourself in a very professional manner. Dear Wally,Thank you for your prompt service on the recent installation of our new heating, air cleaning and air conditioning system. We are pleased with the update of our old system that was installed in the ’70’s (including asbestos duct insulation}, glad to be rid of years of accumulated dust in the ducts and uneven air distribution, and— the old system was expensive to operate. We are relieved that our total system is clean, efficient and now up to code. We knew there were cheaper brands on the market but had decided to install a higher quality system to assure maximum all-season comfort that we could enjoy year in and year out, but also to capture the energy savings potential of a state-of-the-art design. It seemed to us also, frankly, that a high quality system would enhance the market value of our home when it comes time to sell. I know from a lifetime of experience in manufacturing plants, that the system you installed is high quality and well engineered. But my reason for writing goes beyond that. As recent mid-westerners new to California we have had some disappointments in selecting contractors. We wanted to compliment both your service personnel and installation crew for their courtesy, and their obvious expertise. They were well organized, quick, thorough, and left the house clean. It was obvious to us that had been well trained technically and in customer service. And— the job was completed at the cost quoted. We know that wasn’t an accident. We thought we should pass this on to everyone in your organization, from the friendly telephone personnel to the follow up checkout call. Our compliments. You can be proud of your gropu! 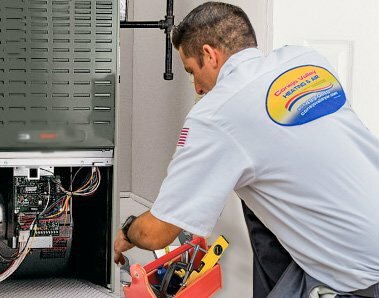 My wife and I requested a proposal from Conejo Valley Heating and Air for the replacement of our heating and air-conditioning system because of our positive experiences with Conejo Valley Appliance and our commitment to locally owned and operated busineses. Wally was the first assess our home and provided a proposal a few days later. I was impressed with his knowledge, pragmatism, and expressed guarantee of customer satisfaction. The next four presentations and proposals did not measure up to Wally’s but they did result some questions. He gladly took the time to explain what the others were talking about and whether or not it made sense. He was the only owner/operator to come to our home. He and his crew were always on time and well mannered. We did have some issues during and after installation. Each issue was resolved quickly and to our complete satisfaction. I would not hesitate to recommend Wally.Chick Z.